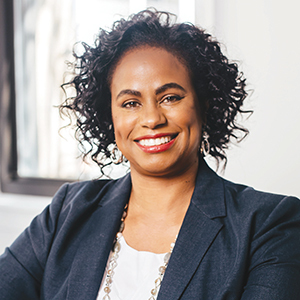 Engineering thinking fuels Brenda Darden Wilkerson's mission to increase access to technology education and careers, particularly for women. Often throughout her career, Brenda Darden Wilkerson (’85) has been the only woman or the only person of color in the room. As a black woman in tech, she knows what it’s like to feel alone in the field. Today, Wilkerson uses her experience to advocate for access, opportunity, and social justice for underrepresented communities in tech. As president and CEO of AnitaB.org (formerly known as the Anita Borg Institute for Women and Technology), a non-profit organization dedicated to connecting, inspiring, and guiding women in computing, she helps millions of women around the world. While the tech industry continues to grow, fewer women choose to enter the field. According to research by Accenture and Girls Who Code, the presence of female computer scientists in the workforce has dropped from 37 percent in 1995 to an estimated 24 percent today. Wilkerson hopes to reverse that trend through her work at AnitaB.org. In fact, she has worked to democratize computer science since teaching computing courses for adults at Wilbur Wright College in Chicago in 1992. She soon became director of Wilbur Wright’s IT training, where her work captured the attention of Chicago Public Schools leadership, who recruited her in 2009 to serve as the system’s director of computer science and IT. While there, she spearheaded the Computer Science for All program, an initiative to increase access to computer science education for students at all grade levels as a basic part of the curriculum. “Technology often feels like an elite sport, and there’s no reason for it to be that way,” Wilkerson says. The program caught the attention of the Obama administration and Wilkerson got to help launch Computer Science for All programs across the country. “To have President Obama’s people come and say, ‘We want to do that, too’—I’m humbled when I think about it,” she says. “I’m just so grateful for his leadership."